Throttle - Hero MotoCorp Ltd. 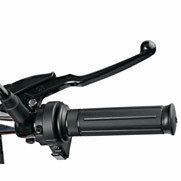 Check for smooth rotation of the throttle grip from the fully open to the fully closed position. Check at full left and full right steering positions. 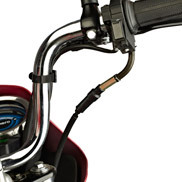 Inspect the condition of the throttle cable from the throttle grip down to the carburetor. If the cable is kinked, chafed or improperly routed, it should be replaced or rerouted. Standard throttle grip free play is approximately 2-6 mm of grip rotation. Slide the grommet, loosen the lock nut and turn the adjuster. Throttle Adjustment On FI Vehicles. 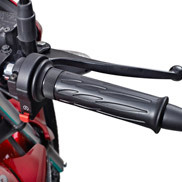 Check for smooth rotation of the throttle grip from the fully open to the fully closed position. Check at full left and full right steering positions. 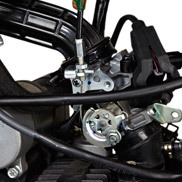 Inspect the condition of the throttle cable from the throttle grip down to the throttle body. If the cable is kinked, chafed or improperly routed, it should be replaced or rerouted. Standard throttle grip free play is approximately 2-6 mm of grip rotation.Loosen the lock nut and turn the adjuster.